Here’s how I converted the Urban Aran pullover into a zippered cardigan. Preparations: Divide the stitches for the front into two equal parts. Add 3 stitches to each center front. The first stitch of each row is slipped to form a turned under edge. The remaining 2 stitches will cover the zipper. Knit the fronts. Block the fronts. Get a zipper. I recommend a two-way zipper because they’re two-times more versatile. Preshrink your zipper. You don’t want anything changing size after your zipper’s sewn in. You can add the zipper as soon as the fronts are done. Pin the center front edges together. The edges should just meet, not overlap. I used stitch markers, and joined the two pieces every ten rows, more or less. It pays to be meticulous before any sewing happens. It’s easier to reposition stitch markers than to dig out a tiny disappearing line of sewing thread. 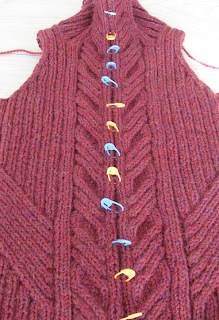 Baste the fronts with contrasting yarn, removing the stitch markers as you go. Baste with an even tension. Don’t warp the edges by sewing tight. Basting will stabilize your pieces so that nothing shifts before positioning the zipper. This step will be easier if you didn’t skip step one. Turn the sweater inside out. Place the zipper face down on the sweater. The zipper teeth should match the center seam. Pin the zipper to the sweater. Note: you can see in the photo below that the zipper is buckling a little. That's because the zipper is a fraction of an inch longer than the sweater. The cables make the center a little shorter than the rest of the sweater, so I stretched it a wee bit so everything matched. It's a judgment call, figuring out if you should stretch the centers, or work in the ease. Depends on the yarn and pattern. 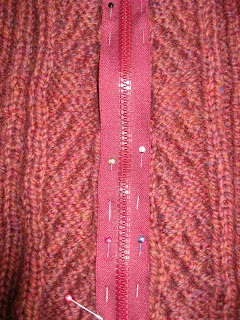 Whipstitch the edges of the zipper tape to the sweater with sewing thread. Make sure this doesn’t show on the public side of the sweater. 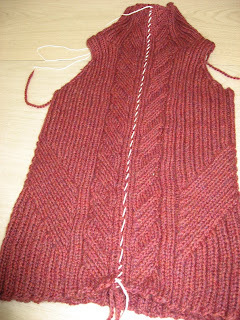 As you stitch, look at the edge of the tape and make sure it stays parallel to the center rows of the sweater. If you see a row curving out, as in the above photo, nudge it straight with your finger as you sew. I like to whipstich before actually sewing the zipper in. It’s like basting and finishing at the same time. Get rid of the pins. Now your zipper is positioned, flat, and ready to be sewn. Turn the sweater right-side out. Pull out the basting yarn. If you leave it in, it could cause a little wave in your seam. The whipstitch should hold everything in place. Turn the sweater inside out. Starting at the bottom of one side, using sewing thread, start a line of stitching. Sew as close to the zipper teeth as possible while still allowing free movement of the zipper pulls—about 1/4 inch. Test the zipper action before sewing too far. Up, down. Up, down. Good job. Use whatever stitch gives you a feeling of confidence. I used a backstitch. Mind the tension. Do whatever you need to do—fold, tuck, trim—to make the top edge of the zipper neat. Enjoy satisfying two-way zipper action! This is the method that works for me (pictures of the finished sweater in this post). But, if this seems like a crummy way of doing things, check out these other tutorials. For detailed advice in determining what zipper length to use, go here. If you need to know how to shorten a zipper, go here. If you’d just like to look at another zipper tutorial, go here. Final Caveat: Don’t trim a zipper before you create a new zipper stop. If you do, your zipper-pull will fall off. Feels like there should be a punch line here. I love your Urban Aran. I have the pattern and would like to make it into a cardi also. Thank you for showing me how you installed the zipper. I have this site bookmarked for reference. All of your projects are beautiful. My biggest issue with sewing zippers is feeding the knitted garment through the sewing machine! I put the feed dogs down and manually feed it through the machine, but it makes it kind of uneven. What do you do? I sew zippers into sweaters by hand. Had I tried machine sewing, I'm fairly certain my thick, fuzzy sweater would have been immediately tangled up in the feed dogs. Hand sewing takes patience, but it does give good control over your materials. Wow. I feel like it's inappropriate to write a love letter to a stranger on the internet, but seriously, this post rocked my world. This is the first time I've *ever* sewn a zipper in successfully. And it looks awesome. Thank you!! I too sewed in my first zipper using this method !! Worked like a hot damn !! Sweater looks fabulous !! Thanks for these simple instructions.